14 Nov Why Do We Exist? Any organization, business or entity worth its salt needs to know why it exists. A hospital exists to provide medical services to people who are sick. Schools exist to educate people. Farmers exist to supply food for themselves and others. And the church….why does the church exist? The church exists to make disciples for Jesus Christ. Jesus himself gives us our reason for being in two statements, what the church commonly calls the Great Commission and the Great Commandment. First, the commission: “Go, therefore, and make disciples of all nations, baptizing them in the name of the Father and of the Son and of the Holy Spirit, and teaching them to obey everything that I have commanded you. And remember, I am with you always, to the end of the age” (Matt 28:19-20). The Great Commandment according to Jesus is to “love the Lord your God with all your heart, and with all your soul, and with all your strength, and with all your mind; and your neighbor as yourself” (Luke 10:27). Producing followers of Jesus who love God, self and neighbor. That’s the church’s purpose in a nutshell. So, how are we doing? How effective are we in accomplishing that purpose? That’s the rub, isn’t it? A hospital measures its effectiveness by keeping track of how many successful surgeries they perform, how many babies are delivered, and how many infections or diseases they cure. Schools measure their effectiveness by testing students to gauge their proficiency in math, reading, science and other subjects. Farmers know that they have fulfilled their purpose if they harvest a crop that then goes to market and becomes part of the food supply chain in their community or in the world. But how can, or how should, the church measure spiritual growth? It is a valid question and also a hard one. There are no empirical tests we can administer, no grading system we can use. And yet, Jesus was not content to let the matter slide, as if it is impossible to tell whether spiritual growth is occurring or not. Jesus was clear that true disciples produce spiritual fruit in the same way a fig tree produces figs. And, Jesus was equally clear that the quality of the fruit would indicate something very real and concrete about the state of a person’s heart and his/her spiritual life. For a lot of people, as long as Jesus—and the preacher—confines this talk about fruit to spiritual fruit—love, joy, peace and the like—things are okay. But, when Jesus—and the preacher—connect spiritual fruit to the issue of money, that’s a different story altogether. I want to ask you to consider the dilemma that faces any preacher who climbs into a pulpit to talk about finances and stewardship. At one and the same time, I am talking to some people for whom tithing, giving 10% or more of their income to the work of God’s church, is a no-brainer. They’ve been doing it for years, maybe all their lives, and it is as regular a part of their faith as praying or serving the poor. Then there are those who do not make any financial contribution to the church. According to statistics, this group can comprise as much as a third of any given congregation, though thankfully, that percentage is much smaller here at Calvary. There are other people who give regularly to the work of God’s kingdom, though their gifts do not reach the level of a tithe, and there are others who occasionally contribute, but in a more random, non-systematic way. Regardless of the size of the gift, many folks are already practicing radical generosity while others have yet to see the connection between faith in Christ and what they do with their lives, including their money. Perhaps you can sympathize with those pastors who experience a lot of stress when the subject of money comes up in the Sunday lectionary or stewardship season rolls around. It is a daunting task, this money business in the church, even for someone who loves stewardship as much as I do. The thing is, Jesus had no compunction at all talking about money. It was not some “add on” to the life of faith that he brought up reluctantly or apologetic-cally. Just the opposite. He had a lot to say about money and he didn’t tiptoe around it. He made clear that our attitudes about money and our possessions are a significant indicator of the health of our spiritual life. So, if we are going to do our job to make disciples who love God, neighbor and self, then we can’t shy away from this subject, either. We need to be as real, as honest, as candid as Jesus was. One of the most readily identifiable culprits in our struggle with money is sometimes called “the culture of more.” More, according to the world we live in, is always preferable to less. So, we supersize our food, even though it is having terrible consequences to our health. We keep buying and buying even though our closets and houses and garages are already crammed. Worse still, much of this buying gets put on credit because we don’t actually have the resources to pay for all we’re accumulating. We are bombarded with messages that we need the latest and greatest of everything, even though what we currently have works just fine, if just a bit slower than the new version. The entire American economy is built on the “culture of more.” Some of the promotion for more is blatant, but much of it has simply seeped into our subconscious over a long period of time, so that it’s “just the way things are.” At that point, we don’t even question the difference between need and want, essentials and luxury. For some of us, the “culture of more” is a powerful allure. But, for others, that’s not the issue at all. For many people, the overriding issue when it comes to money is fear. In survey after survey, Americans say their #1 fear is running out of money in retirement. And, to be sure, there’s plenty of uncertainty that contributes to that fear—uncertainty about the economy and the world markets; about the political winds over which we have no control; uncertainties about our health and the resources we’ll need to take care of the issues we face as we age; about the viability of Social Security and Medicare and whether they’ll be around for as long as we need them. To the degree that fear prods us to plan, to develop sound financial strategies and practices to prepare for educating our children, taking care of emergencies and being ready for retirement, fear can be healthy. But, all too frequently, fear leads us to a mindset of scarcity, of “not enough” and even, “never enough.” It results in worry and turns our focus inward, so that we cling to, even hoard what we have. When fear drives our attitudes and decisions about money, we end up being just as controlled by money as the person who always wants more. We just get there from a different direction. In either case, Jesus knows that faith and the life of discipleship is hindered when we have an unhealthy relationship with money. There are a number of antidotes that Jesus prescribes to help us look more honestly at ourselves in this area so that we can bear the kind of fruit he wants from us. At the crux of everything is the distinction between ownership and stewardship. It is no accident that the Bible begins with the story of creation, with the account of a gracious God whose love is so powerful and pervasive that it overflows, creating a universe of diversity, beauty, goodness, blessing and abundance. Every part of creation is a gift from God. Our lives are gifts. Our abilities to learn, to think, to problem solve—all gift. Our skills to lead, teach, sell, manage people or projects or a home—all gift. The relationships with family and friends that give so much definition and meaning to us—pure gift. Our physical attributes and our health—mental, emotional, physical and spiritual—gift. We receive what is gifted to us and train, learn, harness and use it to earn a living, care for our families and make a life. But, none of it originates with us. We are working with God’s raw materials which makes God the owner of all we are and all we have, and we have the high privilege of being stewards of what belongs to God. If we do not fully embrace this core truth, we will never have a healthy relationship with money and that in turn will severely impact our relationships with everyone and everything else in our lives, including God. But when we really grasp and internalize this truth, we are set free to live a life of cheerful generosity that transforms us and those around us. We saw last week that the natural response to appreciating the gifts of God is gratitude, and gratitude led the Hebrews to make an offering of the first fruits of the harvest. That practice helps to correct both the “culture of more” and our fear of not having enough. The lie of the culture is that we alone are responsible for meeting our needs, but a mindset of stewardship helps us see that since everything belongs to God, God has the responsibility to meet our daily needs. That frees us to be generous stewards of God’s resources. Generosity is the priority, which does not mean we give carelessly. It means we give thoughtfully and prayerfully, seek-ing God’s wisdom and leading, but there is a joyful abandonment to our giving. The problem with giving from the leftovers is that your generosity can never exceed your ability to meet your own needs. If things are going well, there may be some left over. But the minute you face uncertainty, generosity takes a backseat. By its very nature, the concept of generosity is in direct conflict with the concept of self-preservation. There is a point at which being generous could pose a direct threat to your well-being. What results is a real tug-of-war. Your heart wants to be generous, but your emotions register fear. Following Jesus asks us to face our fears head-on. In belonging to him and choosing life in his kingdom, we have signed up for a different economic system than the world touts, one in which we are called to look out for the interests and needs of others in addition to our own. We don’t have to be limited in our generosity by fear and a sense of self-preservation. While sound financial principles are important, there may be times when we are led to step outside our comfort zone, not in careless irresponsibility but as a necessary act of faith by which we grow. Is it scary? Absolutely. But fear and faith often go hand in hand. In fact, when you pursue a growing relationship with God, you increase your exposure to certain fears, since uncertainty is an essential ingredient to faith. No one can know for another person what a faithful level of generosity is. I don’t think Jesus is the least bit interested in giving us pat, easy answers to that question. I think what Jesus is interested in is whether God has our hearts. Jesus cares about having followers who let faith and generosity, not fear and self-preservation determine the fruit they bear as those who love God, self and others. 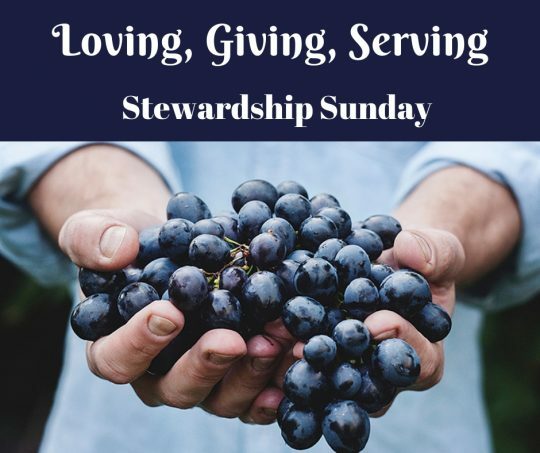 It has been my hope and prayer that this past month of stewardship season has been an opportunity for you to prayerfully consider your own faith journey and what God might be asking of you in order to grow and produce fruit.